At Viessmann, we believe in the philosophy - "the whole is greater than the sum of its parts". Following this, all of our heating systems feature high quality, reliable and effective components, which efficiently work together. All of our products are part of a matching total concept, where each of our components complement one another. Perfect interaction between these system components ensures the maximum potential of our innovative technology. Viessmann system technology incorporates everything you need for a reliable and economical heating system: From the Vitotronic central heating control unit with wireless remote control and powerful Vitocell DHW cylinders for the highest DHW convenience, right up to high grade solar thermal systems for cost effective central heating backup. With ever increasing fuel bills and the need to be as eco-friendly as possible, it&apos;s important that we all look for ways to save fuel and carbon emissions - and money! All gas boilers are now required to be condensing boilers and this represents a huge step forward in environmentally friendly heating, with fuel savings of up to 35% compared to conventional boilers. There is a way to save even more - up to 15% in fact - using a simple outdoor sensor and some very clever Weather Compensation controls, available with the Vitodens range of condensing boilers. For a relatively small investment you&apos;ll not only save up to 15% more fuel each year but you&apos;ll also enjoy an incredibly comfortable home - with a pleasant indoor temperature - whatever the weather. With increasing demands for efficient, multi mode and user-friendly heating systems, the central heating control unit gains ever more importance. 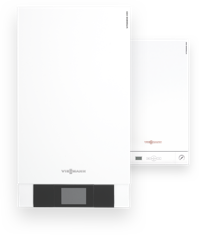 As a response to this demand, Viessmann now offers a standard range of heating control units in the form of the Vitotronic 200/300, which is suitable for all small boilers, wall mounted boilers, medium-sized boilers and heat pumps. Operation with user prompts is easy and intuitive, supported by standard controls, a large backlit graphic display with several plain text lines, a high contrast monochrome depiction and a context-sensitive help function accessible via the "?" key. 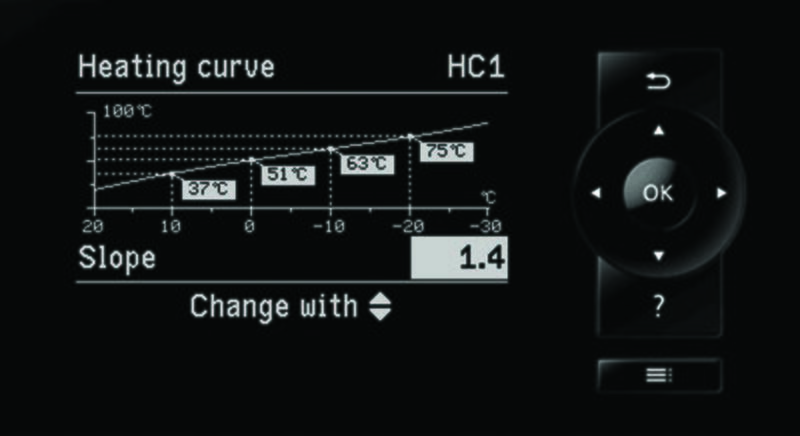 Special functions such as heating curve, solar yield and switching times are depicted graphically. With their attractive design and white, high-gloss casing, the remote controls in the new Vitotronic control unit range are ideal for use in living spaces. Thanks to a standardised operating philosophy, the new Vitotronic units are straightforward and intuitive to use and quickly provide an overview of the heating system at all times. 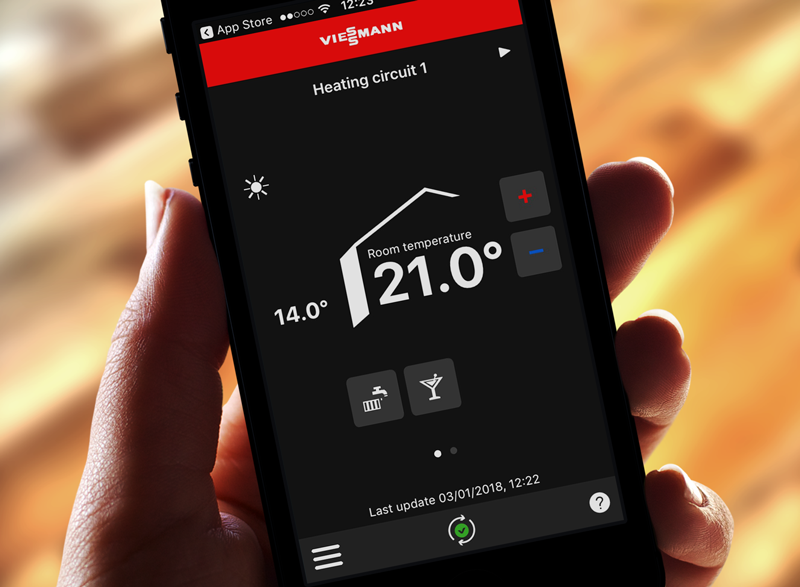 The Viessmann Vitotrol app enables you to operate Viessmann heating systems equipped with Vitotronic control units. Operation from anywhere and at any time is easy, intuitive and convenient. Alongside its operating functions, the Vitotrol app features a variety of help functions to enable you to get the most out of your boiler. The Vitotrol app is available to download on iOS and Android mobile devices. In order to operate the app, the boiler with Vitotronic 200 must be equipped with the Vitocom 100 LAN1 interface and be linked to a broadband router. In the Vitocell cylinder range, you&apos;ll find exactly the right DHW cylinder for your requirements. Depending on your DHW demand and the installation conditions, you can choose a DHW cylinder for installation adjacent to or below the boiler. The quality of the inner surface of the DHW cylinder is crucial to providing DHW hygienically. For this reason, Viessmann relies on two high quality materials: the first being Ceraprotect enamel coating for safe, lasting protection against corrosion for the Vitocell 100 range. Secondly, stainless steel is the "guardian angel" of the Vitocell 300 range, satisfying the highest hygienic requirements. Free solar energy – discover more about our solar technology for DHW heating, central heating backup and power generation. Freshwater modules are used for convenient and hygienic DHW heating in accordance with the instantaneous water heater principle. In contrast to conventional DHW cylinders, the drinking water is not used for storing thermal energy but instead is only heated when required, by means of a powerful plate heat exchanger. The energy for this DHW heating is drawn from a heating water buffer cylinder, which can be heated by a wide range of systems – by solar thermal systems, or by solid fuel boilers, conventional oil/gas boilers, heat pumps or other systems.